1st Anual company picnic this Sunday! We had a blast playing bags, volleyball and badminton. A bug congrats to the egg and waterbaloon toss winners! The raffle and food were the perfect ending to a great day by the lake. Below are some photos from the event. I love my job, I get to meet amazing people, and hear their stories when I arrive to check on roof problems. Recently I went to see a woman who wanted us to tear off her nearly new roof. She was holding full payment from her roofer who had successfully installed her previous roof. She lost confidence when the boss wasn’t there to supervise the workers and the result didn’t look right to her. The guy had returned to address some of the issues but the whole package appeared uneven to her and she was worried that it wouldn’t last. Since it was so cold out we sat at the kitchen table, and she shared her stories while we waited for the sun to burn the frost off so I could inspect the project. A retired doctor, she had been one of only four women in her class at medical school. She had redesigned the remodel of her house producing an amazing space equal to the best work of a good architect. Over time she had more than her fair share of poor contractors, (which provided interesting horror stories), and yet she also managed to find some great ones. We drank hot chai and I learned about her husband, a world class sitar player and the travels to India that they made. I was learning a lot, but I also got to share the history of shingle technology. Her previous roof material had been an organic product, and the new roof was made with fiberglass shingles which are very strong but much thinner. Fiberglass shingles also take longer to settle down on their new home, and until they do, the roof will sometimes have a bad hair day look. When they finally settle down, because they are so thin, any unevenness in the old roof deck will often show through. With the roof warming up and the tea finished, we went up to see what was what with her roof. Over 30 years I’ve seen a fair amount of really bad roofing but this roof was a bit of a shock. It was a great install, ruler straight lines, a good quality 30 year 3-tab fiberglass, plenty of high quality slant back vents, and really nicely done flashings at the chimney and pipes. It takes time to build a quality roof, and it takes even longer to restore lost confidence with people. The happy result was that she doesn’t need another roof, and her roofer will get the rest of his money. Sometimes you just need to hear truth from a trusted third party. These days it is all too common for contractors to throw the competition under the bus, but at Lindholm we see it differently, the golden rule hasn’t fallen out of fashion yet. We still believe that what goes around comes around, here’s hoping if this happens to us, the guy they call has the same value system. And Happy holidays to you. In case there is any concern, all Lindholm roofs are certified safe for reindeer hooves and sleigh rails. Santa likes the look of a well done roof; he sees a lot of roofs every year, and when he sees one of ours he knows that you have been very good. As always, Our family has your family covered. When it’s time to get the new roof, the cost of roofing these days raises its ugly head. Everybody wants a bargain, and everyone wants the roof to be perfect. Folks who would never buy the rusty clunker from snidely Sam’s used car emporium are somehow attracted to the low ball roofing guys with amazing prices and cotton candy warrantees. So how do those low ball guys do it? Step one-use crappy products. There are shingles out there that are so thin they should be only used on a doghouse. Shingles used to be sold by their weight, with a 240lb. shingle being standard. Today a very good 25yr shingle now weighs only about 220lbs. per 100 square feet. There are companies out there putting on 170lb shingles that have been named a ‘number 240’ unsuspecting homeowners think they are buying a 240lb. shingle. Caulks can cost $1.98 a tube for interior grade painters caulk, or $5.50 for high quality exterior caulks. All down the line there are choices installers make between the cheap stuff that will last only a few years on up to quality products that will serve well for 30 years of more. Step two-fudge on insurance. Roofing companies are required by law to carry workman’s compensation insurance to cover workers in case of falls and injury. Shady operators will show insurance certificates that cover safer jobs. Back in the 90’s when I was trying to figure out how these guys get by I discovered that some guys will wave a certificate that covers carpentry (21% of payroll) instead of a roofing cert. (49% of payroll). Or they simply mislead their insurance company and hide most of their employees (by paying them cash). Since labor is often the biggest cost in a roof project cutting corners on the necessary insurance can enable some roofers to undercut honest competitors. Step three-find cheap untrained labor. With the economy tight, any many folks out of work there are areas of town where guys stand on the corner waiting to be hired for the day just to make enough to keep their head above water. If you offer them work they will assure you that thy have lots of roofing experience. Paying cash to untrained ‘roofers’ can save a lot of money on insurance, social security, unemployment, and other costs associated with a skilled employee. Step four-give an amazing sounding warrantee that you have no intention of honoring once the money is in your pocket. Ten, fifteen and even twenty year workmanship warrantees are out there. The standard in the industry is five years. Most of the longer ones are simply a sales gimmick. Remember what the large print giveth the small print taketh away. The safest way is to know your roofer is someone that you can trust. Even the better cars cost more than the junk. Many home and business owners experience leaks in their home. Sometimes it is related to the roof and can be fixed or repaired; other times it may not be a problem with your roof. See the comments below written by an expert roofer who makes it his job to know the answers to these questions. It might not be the roof! Peeling paint does not always equal a leaking roof; ‘sometimes a cigar is just a cigar’ sometimes peeling paint is just peeling paint. Signs of water damage are brown or coffee colored stains, bubbling dry wall, clear drip lines or peeling paint. With a suspect stain, drawing a light pencil line around the perimeter will enable you to see if the stain is slowly getting larger if the stain passes the pencil line you know that moisture is still feeding the spot. Another trick with a suspect area is to drill a small hole (no bigger than a pencil) in the worst section. If moisture is collecting behind the plaster it can escape through the hole and won’t spread damage all over the ceiling. A live drip is a sure sign there is water coming from somewhere, but it may not be the roof. Is the moisture coming from the inside or the outside? Inside ‘leaking’ can be from condensation, frost, cracked or rusted plumbing pipes, leaking condensate pans in attic AC units condensation in bath vent exhaust pipes, and steam or heating pipes that have pin holes. Siding walls, open windows in the attic, rotten attic window sills, dried out window caulking, deteriorated chimneys, and old worn out skylights, can all produce leaks that get blamed on the roof. It may be the roof! The roofer may have made a mistake. 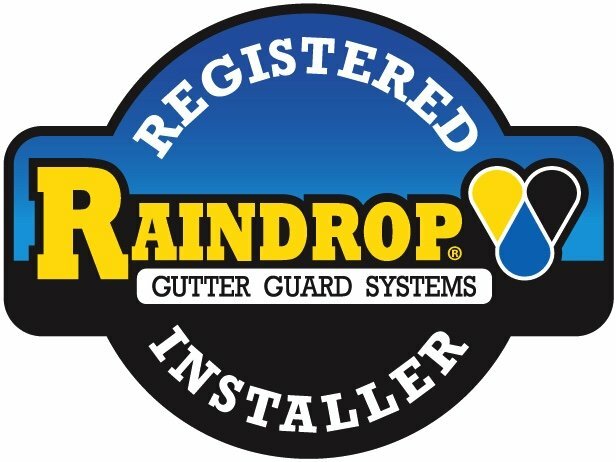 Leaking in a newer roof could be caused by an error in the installation, but it is most often the case that if the leak remains the same after the roof is installed it is very likely that the roof wasn’t the main culprit in the first place. Installing a new roof isn’t rocket science, but it isn’t child’s play either. Any roofer worth the name can install a functional roof. The roof may just be old and dead. When a roof reaches the end of its life cracks and granule loss let rain and snow melt through. It often takes a long soaking rain before the dripping begins. If a quick shower produces a leak, it very likely that some damage has occurred to the roof, hail, blowing branches, bullet holes, cracks in plastic power fan hoods, and animal damage can easily allow large volumes of water into the house from even a short rain. Does That Roofer Look Hot to You? How Lindholm Roofing Employee's feel about extreme heat and warning signs for Heat Exhuastion or Heat Stroke. Years ago when I was working for Lindholm Roofing on a tall roof in Oak Park some young women saw that I was looking hot and actually whistled at me! At least that’s what I told my wife. When it’s 95 degrees outside every roofer looks hot. Roof temperatures can be anywhere from 5 to 20 degrees warmer than the temperature on the ground. How do Lindholm roofers stand it in the heat? Well, after years of working in the heat one gets acclimated to some degree. Most people experience this in the reverse when winter arrives, we pile on the coats, but by spring the same temperature has us feeling comfy in a sweater. After years of working in the heat and putting my hands on hot shingles, I can now hold pots that I used to need a pot holder for. But high temps are dangerous, all the more so if a non-experienced roofer is trying to prove he can ‘take it’. Smart crews work the shady side of the roof, start early, quit in the hottest part of the day and finish in the evening to escape the worst of it. Hydration, hydration, hydration, are the three biggest rules when keeping one’s personal real estate healthy. Alternating water with an electrolyte replacement drink makes a world of difference. Passing out the liquids beats passing out on the roof. Heat can even kill. It is vital to know the signs of heat stroke and heat exhaustion. Elevated body temperature, flushed skin, and not sweating are all signs of heat stroke. Call 911 and get the person to a cool place till help arrives. It’s always nice to show love to your roofer, but in this heat a bottle of water is better than a whistle. Lindholm Roofing takes extra safety precautions when it comes to extreme heat or freezing temperatures. Make sure you contact a licensed professional to help you with your roofing, siding, masonry, or gutter needs.